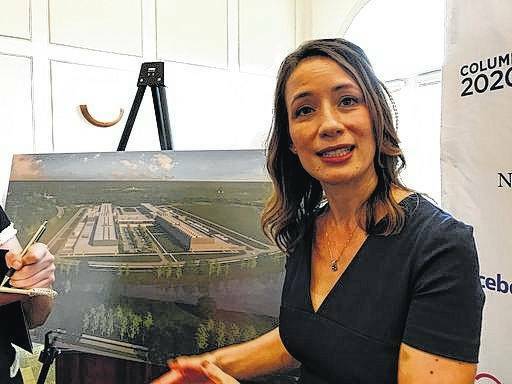 Rachel Peterson, director of data center strategy and development for Facebook, discusses the social media giant’s decision to build a $750 million data center in New Albany. NEW ALBANY — Facebook will spend $750 million on a new data center in central Ohio, the company announced Tuesday — marking another boost for the state’s growing technology sector. The world’s biggest social media company joined Republican Gov. John Kasich and a host of other dignitaries to announce its 10th data center will be in New Albany, just northeast of Columbus. The 22-acre data center will be powered exclusively with renewable energy. It is expected to employ 100 people to start and to begin providing services in 2019. Rachel Peterson, the company’s director of data center strategy and development, said several factors attracted Facebook to the location, including fiber and power infrastructure, government support, livability and the availability of high-tech talent. She said the availability of renewable energy sources, including wind, solar and hydro, was critical to the decision — a factor underlined by Kasich, who has pushed back against legislative efforts to turn back the state’s alternative energy requirements. “It is critical that we continue developing the renewables, because, believe me, at the end of the day, if the Facebooks and the Googles and the PayPals and the Amazons think that we are not committed to renewable energy, they will not come here. Period, end of story,” he said. Menlo Park, California-based Facebook has been adding data centers in the U.S. and internationally to handle the growing number of photos, videos and additional digital content it must process from its 2 billion users. The Ohio project was code-named Sidecat as it moved through the successful application process for $37 million in state tax incentives. “It continues to show not just the Silicon Valley, but job creators all over the country, that, hey, you know what, something must be happening in Ohio,” the Republican congressman said, noting the hope that a synergy is beginning to build. Amazon opened three cloud-computing data center sites in central Ohio last year. The company invested about $1 billion in centers in New Albany and two other Columbus suburbs, Dublin and Hilliard. Kasich said Tuesday’s announcement shows Ohio is diversifying its economy beyond its heavy reliance on manufacturing. He hopes the growing number of tech jobs entice younger workers to move to or remain in Ohio, whose population growth has stagnated as average ages rise. He noted other recent technology investments in the state, including by Explorys, IBM Analytics and Teradata. Cologix, a Denver-based date company, also plans a $130 million data center on its Columbus campus.